VivaGel® (SPL7013, or astodrimer sodium) is antiviral and blocks bacteria. Starpharma has licence agreements with several condom manufacturers, including a consortium of Humanwell-Citic, Shenyang Sky and Land Latex Co. (Sky & Land), Okamoto Industries, Inc. (TSE: JP3192800005) and Koushan Pharmed, in defined territories for a VivaGel® condom, in which the condom lubricant contains VivaGel®. Humanwell-Citic manufactures and sells leading condom brands worldwide, including LifeStyles®. Sky & Land are a major supplier to the Chinese government, which provides around 3 billion condoms per annum to the public through various initiatives. Okamoto is the market leader for condoms sold in Japan, which is the world’s second largest condom market. Koushan Pharmed is one of the fastest growing pharmaceutical companies in Iran, where 60% of the population of 80 million are under 30 years’ of age. 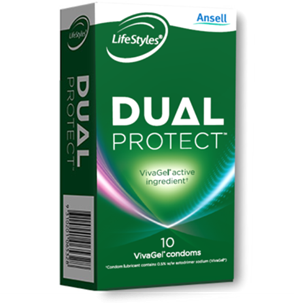 The VivaGel® condom is sold under the LifeStyles® Dual Protect™ brand. The physical barrier of the condom provides primary protection against sexually transmitted infections (STIs). The condom is lubricated with VivaGel® lubricant. VivaGel® is an antiviral agent proven, in laboratory studies only, to inactivate HIV, herpes simplex virus (HSV) and human papillomavirus (HPV), which are viruses that cause STIs. Starpharma has not received regulatory certification regarding Zika virus activity for the Dual Protect™ condom. Regulatory processes are underway to enable marketing in other geographic regions. Starpharma receives royalty and other payments from the agreements, and the condoms will carry the VivaGel® brand.